We are pleased to announce an advanced pedagogy workshop for Haitian professors who participated in the MIT-Haiti workshops in January 2013. This workshop will be held in Port-au-Prince on August 12-14, 2013. 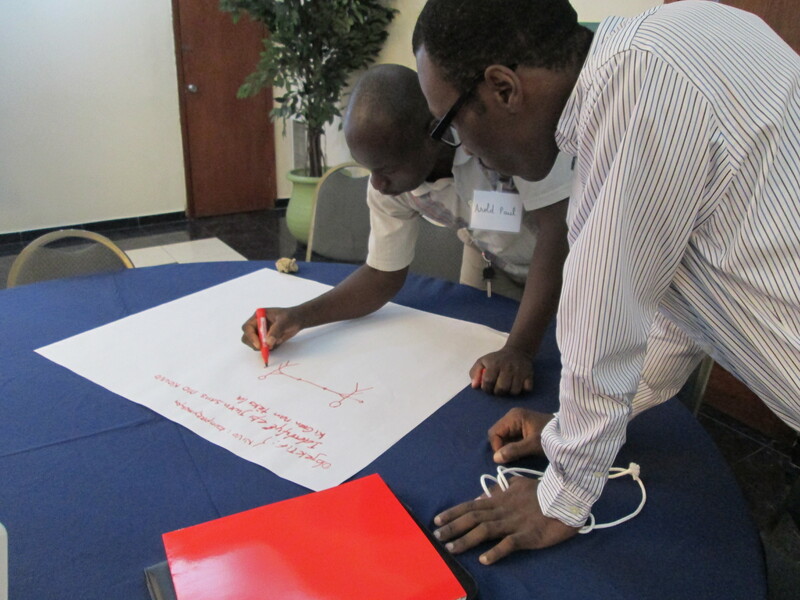 This is the third workshop in a 5-year series whose main goal is to implement and evaluate learning gains achieved through faculty- and curriculum-development activities based on Kreyòl-based Open Education Resources for science and math courses in Haitian schools and universities. This workshop will focus on pedagogy, assessment and evaluation in the fields of math (calculus, differential equations), physics (electro-magnetism, electric circuits and Newtonian mechanics) and biology (biochemistry and genetics). It will build upon the January ‘13 workshop experience, to give participants more working knowledge of active-learning concepts and focus on curriculum development, pedagogy and assessment. This workshop will provide participants with a good basis for creation of lesson plans using active learning resources in Kreyol, and assessment of student learning gains. This workshop is designed, not only to enhance the use of active learning methods by participants in their own classroom, but also to prepare the way for an outreach by Haitian participants to other Haitian academics, along the lines of the “séminaires itinérants” that are currently being designed by a consortium of Haitian universities (Faculté des Sciences and École Normale at the Universitéd’ Étatd’ Haïti, ÉcoleSupérieured’Infotroniqued’Haïti, UniversitéQuisqueya, UniversitéCaraïbe). We will also use this opportunity to achieve a deeper understanding of the syllabus and actual teaching conditions in Haiti, and to develop a long-term evaluation plan in collaboration with our colleagues in Haiti. The deadline for registration is Monday, July 8, 2013 or when all the slots are filled. Throughout the August workshop, the MIT-Haiti team will be working with you to develop an idea into a lesson plan that you can use in your course. It is very important that you think about the following criteria. your students have a difficult time learning. At the August workshop, you will create a lesson plan to teach this concept. Which technology STARbio, STARgenetics, Mathlet, or PhET, will be used? What content will students need to know to better understand the concept? Be specific. What resources (software, handouts, projector, etc.) do you have available or will need to teach this concept in your classroom? Will you be able to devote the needed class time to instruction about this concept? Your answers to these questions will be the beginning of the planning that you develop during the workshop. Please bring a copy of your answers with you to the first workshop on Monday, August 12, 2013. Next Workshop: The fourth workshop in this series is tentatively scheduled for Spring 2014–exact dates to be announced as soon as possible. This workshop will focus on introducing new faculty to the MIT-Haiti Initiative and to active-learning pedagogy, technology tools for STEM and the key role of Haitian Creole in the promotion of active-learning in Haiti.